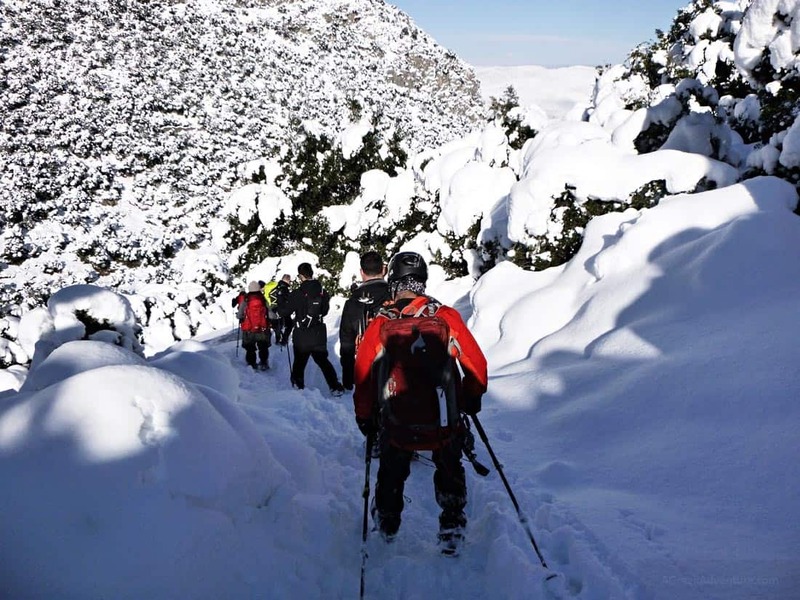 Mount Parnassus is a multifaceted mountain of Central Greece, relatively close to Athens. Many interesting sites and landmarks reside on this mountain, like the Oracle of Delphi. It’s height is 2457mt at its tallest point. Lots of villages reside around the mountain. Many are popular, like Arahova (the famous ski centre with the sections of Kellaria and Fterolakka), Agoriani (very picturesque) and so many more. At the feed of the mountain is the sea of the Corinthian Gulf with great seaside cities and villages like Galaxidi, Itea, Antikyra. 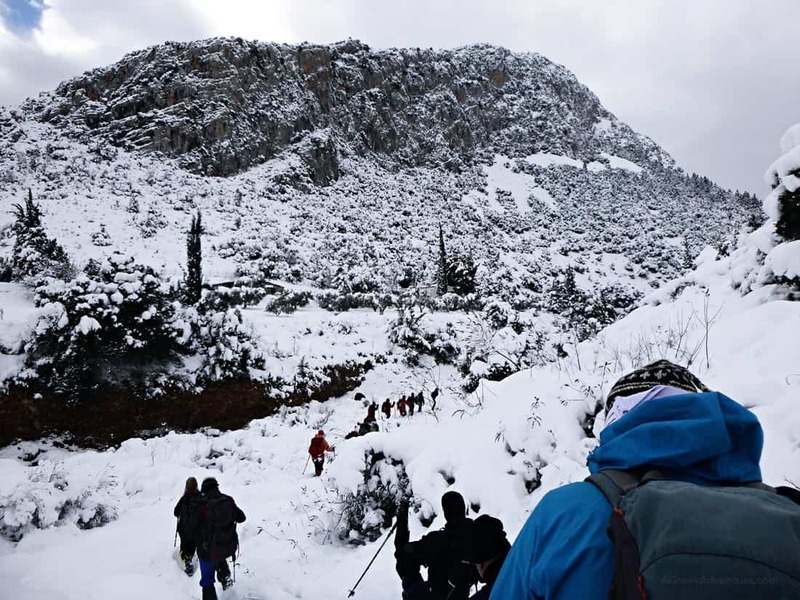 On top of that, Mount Parnassus is a popular trekking destination, since there multiple routes all over the mountain. This mountain and the surrounding area attract people all year around. Imagine that the Arahova ski resort and installations are no more than 2 hours driving time from Athens. What is the etymology of Parnassus? The word “Parna” means: house or temple; the mountain of the house of the god. Parnassus was considered a sacred mountain. Why is Mount Parnassus sacred? According to the myth it relates to Dionysus, its mysteries and Apollo. It was also the home of the Muses and relates to Pegasus, the mythical winged horse. Furthermore, the famous Corycian Cave was here, that was dedicated to Pan (the God who was half a goat). 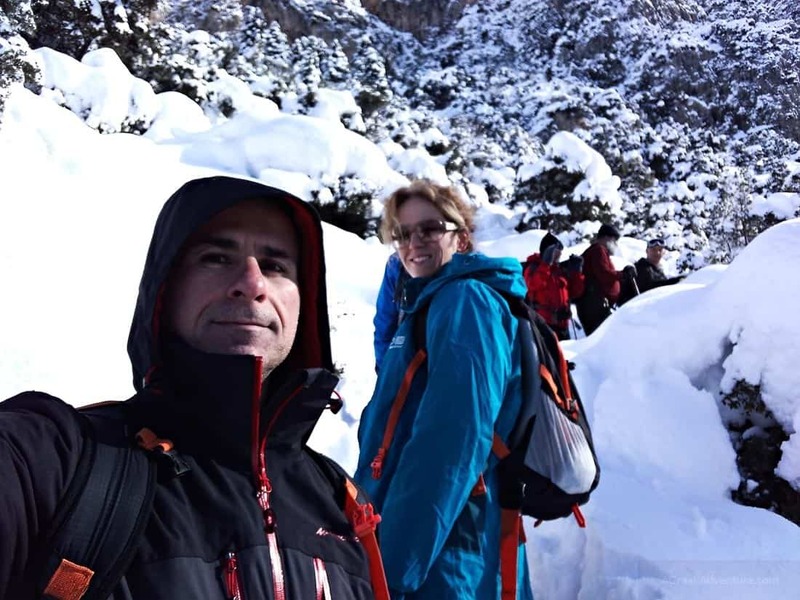 It was our first winter trekking trip (with snow) at Parnassus and proved to be lots of fun, with tons of snow. 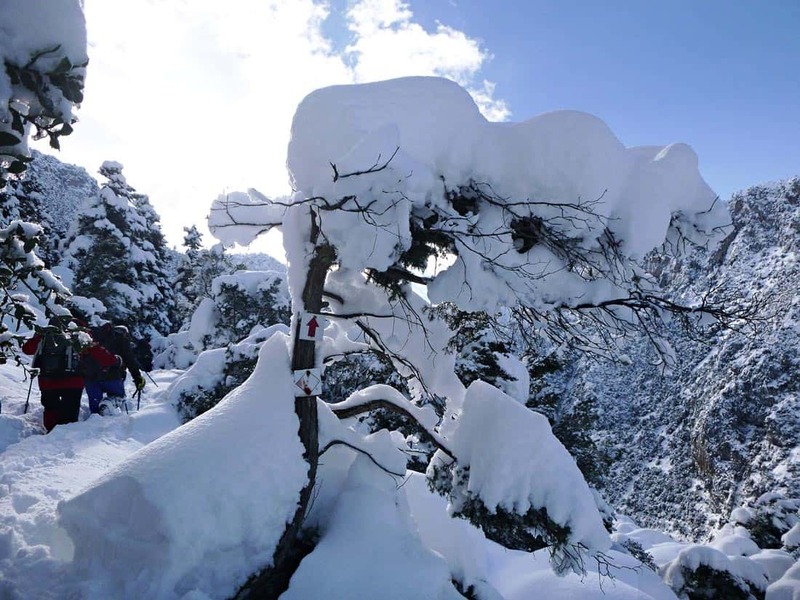 It was that period where lots of snow fell in a very short time all over Greece. 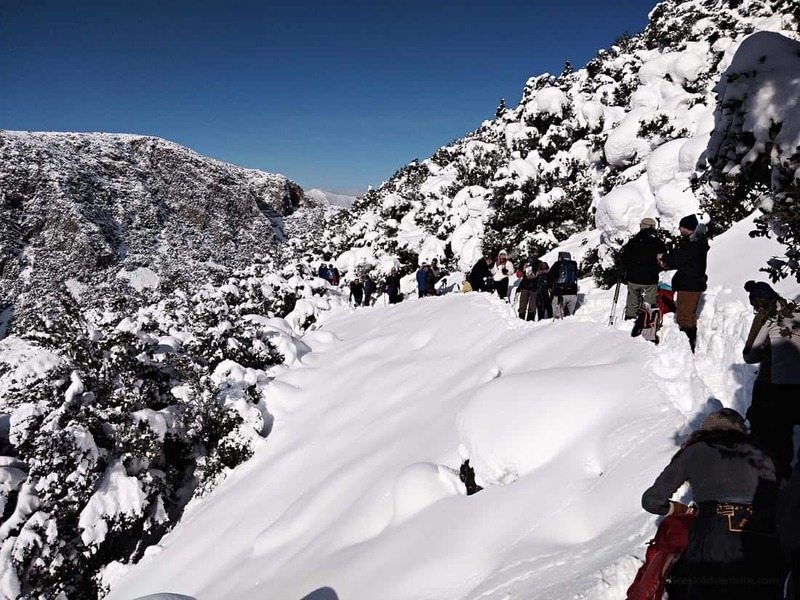 We planned to trek immediately after the first days of snowfall; snow was powder like. 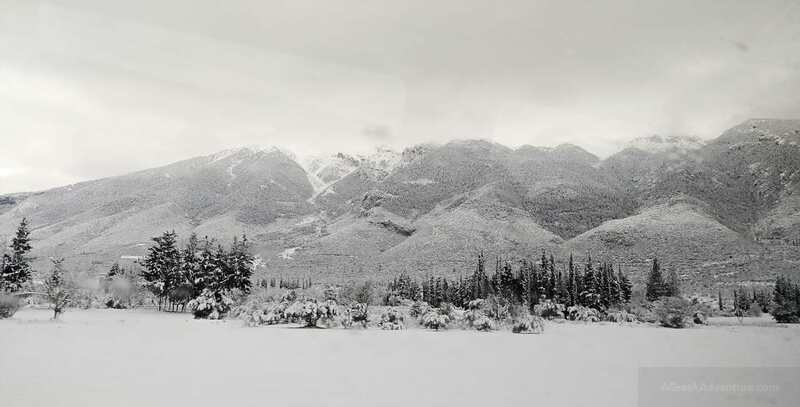 However, that sudden snowfall blocked all roads leading to the mountains. As we arranged to trek with a group of 50 people, our coach (bus), the bus couldn’t reach the initial starting point to start our 5-hour trekking. A small car could but not a big coach. As we approached the mountain, a decision was taken from the trip leader and mountain guide to trek from a different place, but on the same mountain. That place was Amfikleia and was reachable. That route is named: From Amfikleia to the Gorge of Keramidiou. 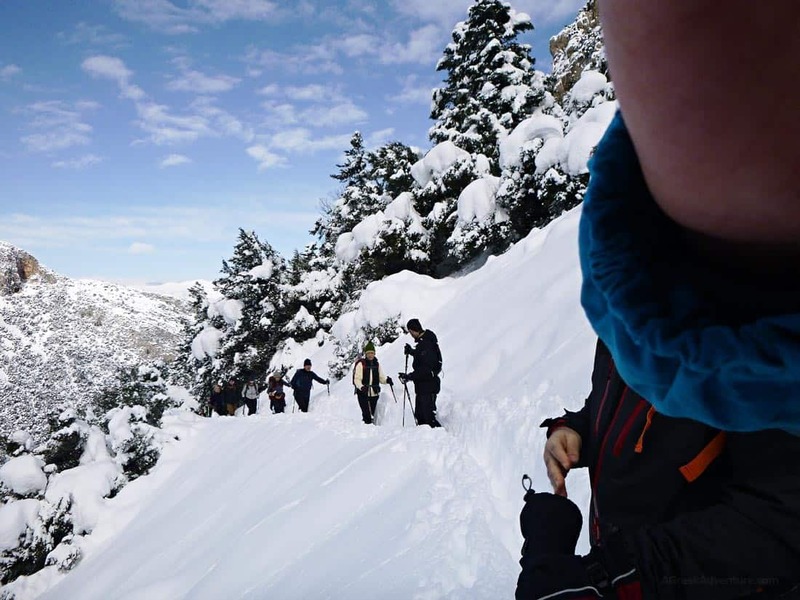 Our trekking started from within Amifikleia, but 10 minutes after we left the village behind us and started moving up the northern part of Mount Parnassus. It was freezing cold and despite moving upwards all the time, we didn’t remove our outer layers (hard-shells). Yes, it was that cold! We didn’t encounter constant strong winds, except in a couple of turns. It was cloudy all the time with sun breaks around late noon. However, snow was constantly at waist level. The head of the team had to literally open the path by plowing through the snow with his body. The rest of the team followed along, placing their feet carefully on the steps of the person ahead them. 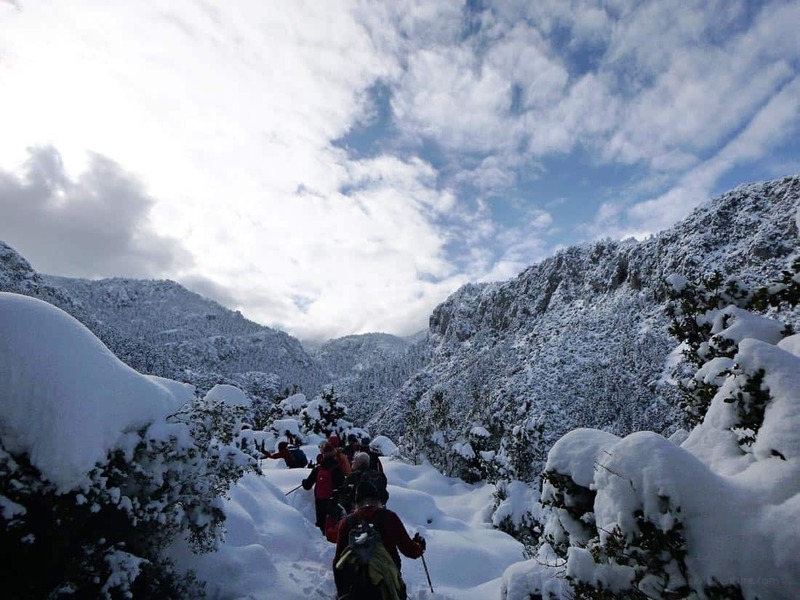 Snow was really fresh on Mount Parnassus and everything was covered so much. It was not possible to see if the next step (or the ones at the left and right of our feet) was hiding plants and slippery rocks or solid ground. Movement was slow but that gave us the time to admire the landscape a lot. Going constantly up on a rather steep terrain and sharp angle, did build a strong pair of quadriceps. Going down was a bit challenging as previously walked over snow was starting to freeze and terrain was rather slippery. The team managed to return to Amfikleia safe and… hungry. To cope with the hunger coming from all that exercise we moved to the nearby city of Livadeia, famous for anyone seeking for roast meat, especially “souvlaki”. We sat at “Taverna ta Kopsidia”, 5 minutes walking from the famous “Kria” of Livadeia. Fantastic fresh and well-cooked food, served impressively fast. “Kria” is a great stone paved area with a river (inside the city) and small waterfalls, plus a hiking route going high on the mountains from where you can see the whole greater area. Having fulfilled all 5 senses, we took the coach back to Athens. Tired? Yes, but it was a splendid trekking trip, despite the last minute change. Tip: When you trek in winter you need to use gear that is proper for cold weather conditions. Explore the hiking gear section of our blog for such. 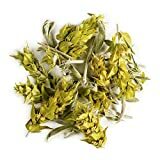 Greek Mountain Tea - Mt. 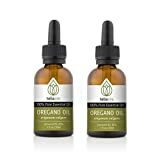 Othrys, Organic, High Flower Content. High Antioxidant and Polyphenol content - 3rd party Lab tested.